Being Free-thinkers who had been associated with socialist experiments and who had moved to Liberal, Missouri, which was expressly for liberals, it’s not surprising that the Noyes family would form their own family constitution. The document displays the year as being 283. Nancy Benton sent me the document. Below is a transcription and images. Liberal, Mo. February 10th 283. 1. The Name of the Society shall be Home-Circle. 2. 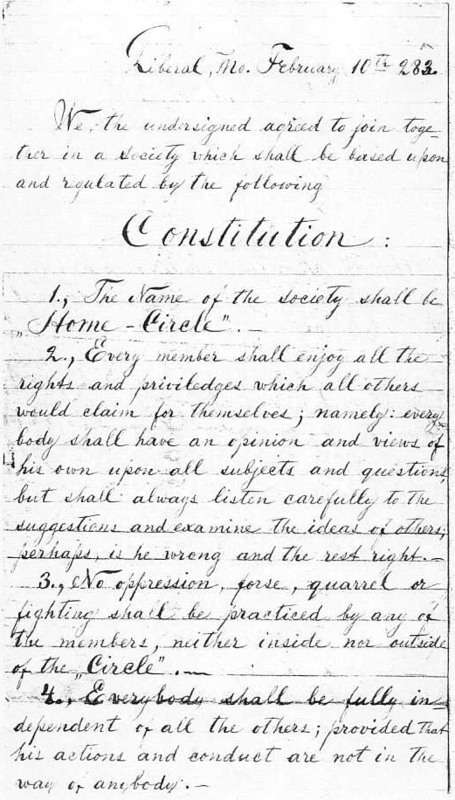 Every member shall enjoy all the rights and priviledges which all others would claim for themselves; namely: every body shall have an opinion and views of his own upon all subjects and questions but shall always listen carefully to the suggestions and examine the ideas of others; perhaps, is he wrong and the rest right. 3. No oppression, forse, quarrel or fighting shall be practiced by any of the members, neither inside nor outside of the Circle. 4. Everybody shall be fully independent of all the others; provided that his actions and conduct are not in the way of anybody. 5. Nobody shall dictate or prohibit anything to anybody else, unless he is directly concerned in the business. 6. 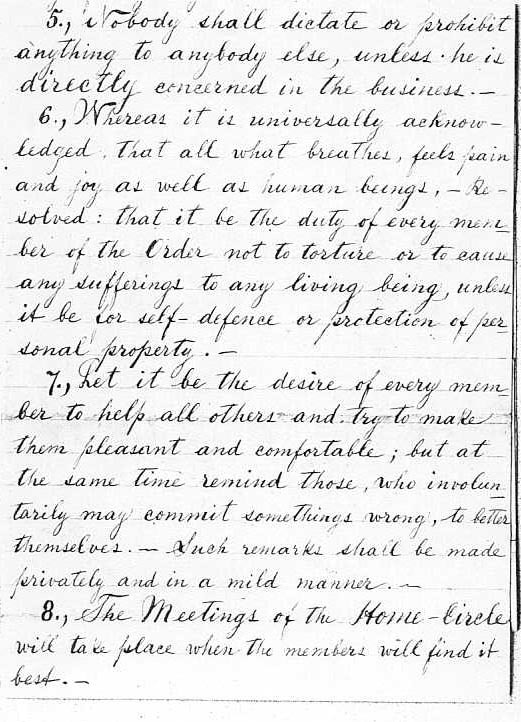 Whereas it is universally acknowledged that all what breathes, feels pain and joy as well as human beings, — Resolved : that it be the duty of every member of the Order not to torture or to cause any sufferings to any living beings, unless it be for self-defence or protection of personal property. 7. Let it be the desire of every member to help all others and try to make them pleasant and comfortable; but at the same time remind those, who involuntarily may commit somethings wrong, to better themselves. Such remarks shall be made privately and in a mild manner. 8. The Meetings of the Home-Circle will take place when the members will find it best. 9. 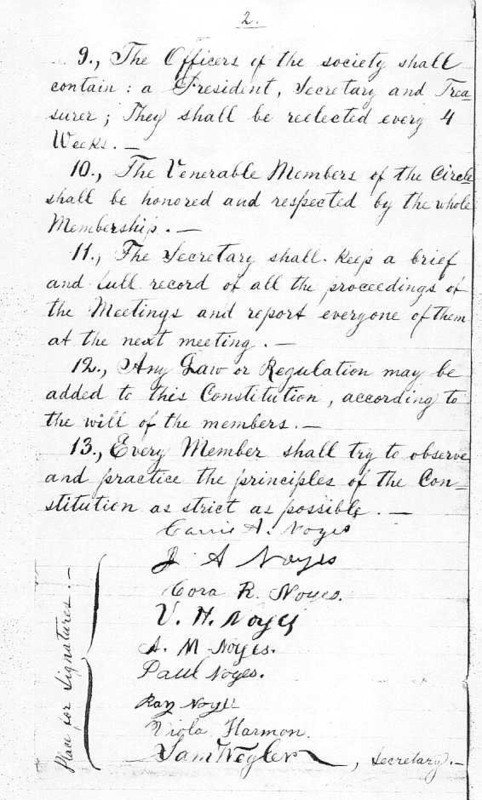 The Officers of the society shall contain: a President, Secretary and Treasurer; They shall be reelected every 4 Weeks. 10. The Venerable Members of the Circle shall be honored and respected by the whole Membership. 11. The Secretary shall keep a brief and full record of all the proceedings of the Meetings and report everyone of them at the next meeting. 12. Any Law or Regulation may be added to this Constitution, according to the will of the members. 13. Every Member shall try to observe and practice the principles of the Constitution as strict as possible. The document reveals the thoughtful respect, dignity, empathy, and compassion family members expected to be displayed by another both in and outside the home, and the allowance of perhaps an unusual degree of independence as well. Quite a different arrangement from the utopian experiment conducted by their relation John Humphrey Noyes of Oneida fame. We see all the children were present to apply their signatures, including the eldest daughter Emma Viola Harmon, who had moved to Chehalis in Washington State with her husband, but was apparently visiting. Sam Wegler is given as secretary for this meeting. I have examined several censuses and can’t begin to place who this individual may have been.